Rhizomes horizontal, shallow, internodes 1.0-3.5 cm. Leaves: petiole 6-20 cm, crisped-hirsute. Leaf blade not variegate, cordate-reniform to reniform, 4-8(-20) × 8-14(-21.5) cm, apex rounded or obtuse; surfaces abaxially appressed-hirsute, usually sparsely so, adaxially appressed-hirsute, at least along main veins, marginal hairs perpendicular to margin or curved toward apex. Flowers erect or ascending; peduncle 1.5-3 cm; false calyx tube cylindric, externally tan or purplish, hirsute (often densely), internally white or pale green, occasionally mottled with purple, with white or purple hairs; distal portion of sepal spreading or reflexed at anthesis, 6-24 mm, apex apiculate to acuminate or filiform-attenuate, abaxially green or purple, hirsute, adaxially purple, puberulent with crisped purple or pale hairs; pollen sacs 1-1.5 mm, sterile tip of connective on inner stamens purple, 0.5-1 mm, shorter than or about as long as pollen sacs. 2 n = 26. Flowering spring-early summer (Mar-Jul). Understory of deciduous (rarely coniferous) forests; 0-1300 m; Man., N.B., Ont., Que; Ala., Ark., Conn., Del., D.C., Ga., Ill., Ind., Iowa, Kans., Ky., La., Maine, Md., Mass., Mich., Minn., Miss., Mo., Nebr., N.H., N.J., N.Y., N.C., N.Dak., Ohio, Okla., Pa., S.C., S.Dak., Tenn., Vt., Va., W.Va., Wis. 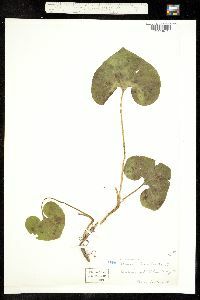 The rhizomes of Asarum canadense are occasionally used for seasoning. Handling the leaves is said to cause dermatitis in some people. Native Americans used Asarum canadense medicinally to treat flux, poor digestion, swollen breasts, coughs and colds, typhus and scarlet fever, nerves, sore throats, cramps, heaves, earaches, headaches, convulsions, asthma, tuberculosis, urinary disorders, and venereal disease; as a stimulant, a seasoning, and a charm; and to strengthen other herbal concoctions and heighten appetite (D. E. Moerman 1986). Perennial colony-forming herb 10 - 20 cm tall Leaves: alternate, with a 6 - 20 cm long bristly-hairy stalk. The blade is 4 - 8 cm long, 8 - 14 cm wide, heart- to kidney-shaped with a rounded to blunt tip, sparsely bristly-hairy, and arises in pairs from the rhizome. Flowers: solitary, arising from between a pair of leaves, erect to ascending, 2 - 4 cm, lacking petals but having a tubular calyx ending in three sepal lobes and twelve stamens. The calyx is reddish brown and densely bristly-hairy on the outside, white to pale green (sometimes mottled purple) with white or purple hairs inslde, and the reddish brown sepal lobes are spreading to reflexed at maturity. Fruit: a fleshy capsule containing egg-shaped seeds with fleshy appendages. Similar species: Aristolochia serpentaria differs by having S-shaped flowers, dry capsules, and lance- to egg-shaped or oblong leaves borne on an erect stem. Habitat and ecology: Locally common in wooded floodplains, but also found in upland mesic sites. Notes: The common name, wild ginger, comes from the ginger-like scent released when the roots are bruised. However, true ginger comes from Zingiber officinale. This species makes a great native, shade-tolerant groundcover in gardens. Etymology: Asarum comes from the ancient Greek name, asaron, with unknown derivation. Canadense means "from Canada." Infrequent to rare throughout the state or absent from some areas. It is found in habitats similar to those of the preceding species but in more protected situations; hence it is restricted more to deep ravines and steep wooded slopes. The length and position of the acuminate portion of the calyx lobes are variable. In Indiana the length of the acuminate part varies from 5-20 mm and the calyx lobe and its appendage may vary from erect to spreading or spreading with the tips incurved. The whole plant in this and the preceding species varies greatly in size and the flowers vary in proportion. As a rule, the more vigorous the plant the longer the calyx lobes. All of our reports for Asarum canadense var. acuminatum Ashe I am referring to this species. [Asarum reflexum, if recognized, is] infrequent to frequent in moist, rich soils in woods throughout the state. It spreads mostly by underground stems, hence it is always found in dense colonies, usually in the lee of an old log or treetop where there is an abundance of leaf mold or in some sheltered situation on a wooded slope or in a ravine.